When it comes to safety, we usually think of personal safety first. Second, we like to think of the safety of those around us...family, friends, co-workers, etc. It can be easy to overlook small things that we can do to make our lives just a bit safer and that is why I love Master Lock. They seem to have all these little things already figured out and truly, they think of ideas and ways to keep us safe by giving us products to enable safety. One group of people that truly need our help in staying safe are the elderly and honestly, I think they are forgotten alot of the time. Master Lock has created some products to aid in the safety of the special seniors in our lives and for that, I am grateful. Whether you are looking for a Portable Key Safe in which they can keep keys, Master Lock has it. Or, if you are concerned about someone breaking into their home through a sliding glass door, Master Lock also carries a Door Security Bar. I find that my sliding glass door gets iced up sometimes and the lock doesn't fully engage. Sometimes, these things get looked over and that is where the security bar would come in handy. Master Lock has launched a campaign for the month of February that focuses on senior safety. Below are some tips that Master Lock has shared and I wanted to pass them on to you so you can help keep your loved ones safe. 1. 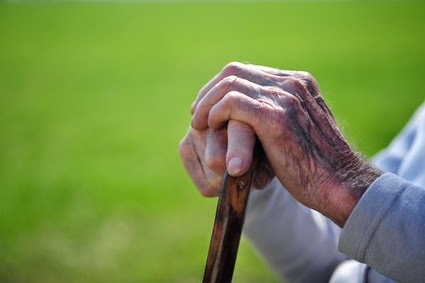 Be Alert When Out and About: Property crimes represent the highest share of crimes against those 65 and older – nearly nine out of 10 – according to the National Elder Law Network. Master Lock recommends that seniors be alert and aware of their surroundings when out of the house and to keep valuables protected. For example, always lock cars, even if they’ll only be unattended for a few minutes. Keep packages and valuables out of sight, and always check the area around your car before entering or exiting. When out in public, women should wear their purses close to their body and men should carry their wallet in an inside coat or front pant pocket. 2. Lock Up Home Safety: Typically a place of comfort and refuge, seniors should never have to worry about safety in their own home. For added protection beyond traditional door and window locks, safeguard sliding glass and patio doors with the added strength of a Master Lock 265DCCSEN Door Security Bar and consider a home alarm system to alert against intruders. Keep doors locked both when you’re home and away, but allow access to a friend or family member in case of emergency by storing a spare key in a trusted key safe, such as the Master Lock 5422D Key Safe. 3. Secure Personal Items in a Group Home Environment: Misplaced or stolen belongings are a frequent complaint of nursing home residents. Keep valuables safe by storing them in an easy-to-use, locked safe that only you and a trusted companion know the combination to. Small items, such as credit cards, jewelry or cash, fit in the portable Master Lock 5900D SafeSpace, while larger items, like documents or memorabilia, can be stored in a fire-resistant safe from Sentry Safe. 4. Protect Against Identity Theft: Mature consumers (ages 50 and over) represent the largest demographic of identity theft victims, according to the Federal Trade Commission. Why? Consumers in this age group typically have more assets than younger consumers, making them ideal targets. Reduce your risk by never carrying your social security card; shredding documents that contain any identifying information; keeping personal information such as bank statements, Medicare statements and social security numbers in a locked safe; and storing credit card numbers in a safe location for easy retrieval if they’re lost or stolen. The Master Lock Vault – a free, digital safe deposit box – is a secure, reliable location for storing credit card numbers and digital copies of important documents for easy access from any smart phone or computer. 5. Think Twice Before Divulging Personal Information: Seniors are also major targets of fraud, such as telemarketing scams, according to the American Association of Retired Persons. Follow the general rule of thumb that if an offer seems too good to be true, it probably is. Never rush into signing anything, and never give your credit card, Social Security, Medicare or bank account details to anyone over the phone. When in doubt, check with the Better Business Bureau or police. I love these tips. It is so easy to forget about the things mentioned...I hope all of you will share these helpful tips with those that you love. I was able to check out one of the products mentioned above and the product I chose for this review was the Master Lock SafeSpace. This SafeSpace is a handy case that is small, transportable, durable and perfect for keeping valuables safe while out and about or at home. It looks pretty sleek and is easy to carry around with you. To keep people out of it, there is a combination lock (protected by a rubber flap) that you set so only you know how to unlock it. Once the combination has been correctly entered, you press the buttons on either side of the combination pad and the case opens. These numbers are easy to read as well, which is nice. The inside of this case is surprisingly roomy and has a nice foam padding to keep things from getting damaged. As you can see in the above photo, I can fit a number of items inside and there is still room for more. If you frequent the gym, this would be SO handy...you would not have to rent a locker for your valuables! I remember my gym days and something like this would have worked great because I seldom wore things with pockets. 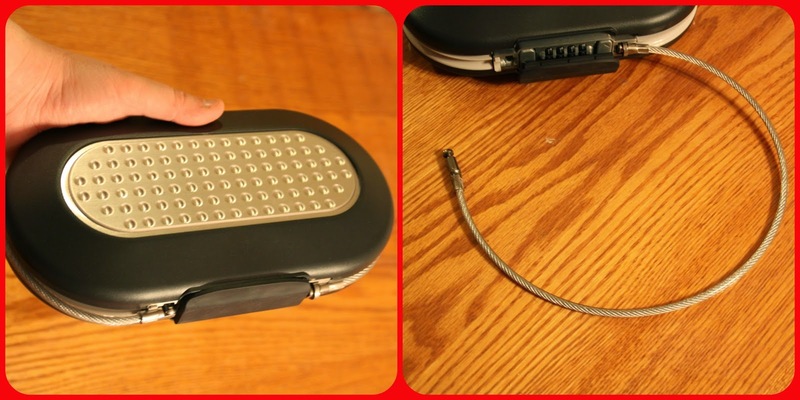 This case comes with a cable that can wrap around something to keep it from getting stolen. It kind of looks like a bike lock cable. I love how easy it is to carry this safe from one place to the other...it fits in my hand and would really fit anywhere I need it to. I can especially see myself putting this in my car, between the front seats. It would fit perfectly there! This SafeSpace is perfect for protecting MP3 players, cell phones, cameras, gaming devices, cash, credit cards, jewelry, keys, passports, sunglasses or other small valuables. The Master Lock SafeSpace retails for $27.59 and would make a great gift for anyone! With this being the month that Master Lock focuses on our seniors, why not purchase this for an elderly loved one in your life? I am sure they would love it. I love this SafeSpace and will definitely be getting alot of use out of it in the future. Disclaimer: I received no monetary compensation for this post. I did receive free Master Lock products and Gift Card for review purposes. All quotes and stock photos are from the Master Lock website and email. Prize is being provided and shipped by the sponsor. This blog is not responsible for lost, stolen or damaged prizes. All thoughts and opinions are 100% mine. I would love to have one of the cable locks for a bike - Model No. 8143DPNK. I also like the Keyed Fire Retardent Locking Security Chest. I could use a Keyed Fire Retardent Locking Security Chest. I would like to have the Model No. 5422D 3-1/8in (79mm) Wide Set Your Own Combination Push Button Portable Key Safe. My kids are forever losing the house key so this lock would prevent that. The Keyed Fire Retardent Locking Security Chest would be great to store important papers in. I would like the set your own combination backpack lock. I would love to have the Keyed Fire Retardent Locking Security Chest. This would be great to put some bigger items and personal papers in. I would love to have the SafeSpace in pink, I love the pink one, I would also like the set your own combination locks. I would love to have the Keyed Locking File Box also. I would get one of the bicycle locks. I would love to have a bike lock. I would love to have the Keyed Fire Retardent Locking Security Chest. I'd like the Pepper Spray. I'd need to get one of their TSA locks before I travel this summer. I'd love to have the 8290DPS Motorcycle Lock. I think I'd like a bike lock! I would love to have the Portable Push Button Key Safe. I would love to have the Keyed Fire Retardant Locking Security Chest! 20 Gauge Steel Dual Function Adjustable Door Security Bar. I would like the Portable Push Button Key Safe. I like the bicycle lock that looks like handcuffs. The luggage locks might at least deter the baggage handlers from getting into your bag--from the news, there are plenty of them they can get into very easily! The 1500eXD – dialSpeed™ Digital Combination Padlock looks really cool! I like the 5ft (1.5m) Long x 5/16in (8mm) Diameter Keyed Cable Lock. I would love to have the Door Security Bar. That would make me feel safer at home. Thank You for the giveaway… we like the Model No. 2120D - Set Your Own Combination Computer Lock with Self-Coiling Cable.